GC6912P. Lakeside Lake. Tucson, Arizona. As this cache is at Lakeside Lake it reminded me of my mom’s carp. Back in the 1980s, my Okinawan mom put a pond with carp in the backyard. She spent a lot of time on it, creating a mountain of rocks behind it. It had a wooden roof to keep the sun off. When she first bought the carp, they were little babies and they grew a little. However, after about six months, mom started finding them one by one in the morning, dead by the pond side. She had paid a pretty penny for the carp but I think the pond was too shallow so the cats could pull them out. Feeling sorry for the carp and not knowing what else to do, she threw all the survivors into our neighborhood’s Lakeside Lake. Now there are reports of carp in the lake. Duh. Has to be mom’s carp’s descendants unless other people started throwing more carp in there which I doubt. 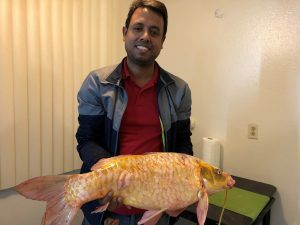 Not a lot of people have carp in Tucson, you know? Carp grow a lot bigger when they have a bigger space and food available. So the ones the size of a hand in our backyard could be any size now. Wiki says the longest reported lifespan of a domesticated carp is 38 years. A guy reported he caught an 11 pound carp and showed it on Angler’s Report. I think that’s carp he caught is one of mom’s carp’s descendants. Pretty cool, right? On another note: Game and Fish looks down on people dropping their castoff fish into the lakes. Some species can be invasive and cause problems with the other fish stocked there. At Silverlake, a fisher caught a Pacu fish which is a relative to piranhas and has almost human-looking teeth. The fish tried to bite him after he caught it. Here’s that Pacu story on USA today. Note for Tucson fishers: the city also stocks Lakeside Lake with catfish and rainbow trout annually. There has also been reports of largemouth bass, redear and hybrid sunfish, bluegill, and crappie (probably descendants of previously stocked city fish). You do have to get an urban fishing license to fish. Among city lakes including Lakeside, the city has put in “state-of-the-art aeration systems to improve oxygen conditions for fish, and parks set limits on the amount of fish each person may catch”. The limits vary depending on what kind of fish it is.